And what exquisite fruits… that night the girls and I sat down at the bar tended by the talented Katie Nelson, with three Season Tickets garnished with mint and cucumber to start. Spring may have failed us outside in the chill, but inside was a garden of delights. The Season Ticket is a classic cocktail from a book by William Terrington, Cooling Cups and Dainty Drinks, published in 1869 when the style of drinks known as “cups” was all the rage (favorite quote from the preface? 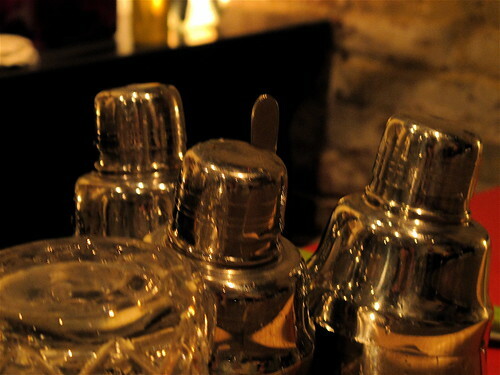 “the author has given special attention to the subject of Refrigeration – almost a new art among us” – imagine those days when proper ice really was immensely important to your drink!). It’s composed of palo cortado sherry, lemon juice, minted simple syrup, and topped with sparkling cider (Katie used Michel Jodoin from Quebec). 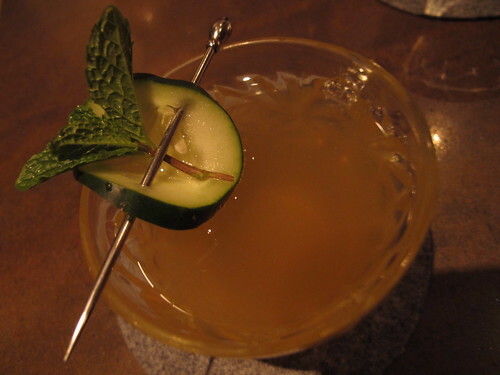 That garnish of cucumber slice and mint sprig was secured with a metal pin we all instantly coveted, and served appropriately in a rather dainty cup. As a crystal collector I’m always ooh-ing and aah-ing the glasses they use at the Columbia Room, as they align form and function so well (also, they are just damn pretty). We all felt the taste of the drink itself was like an elusive memory of some forgotten spice, the sherry and the cider in harmony to create an instant connection to the days of ladies sipping cups and dropping calling cards. Next up was the Perigee Moon cocktail, appropriate considering our visit was just a few days after the “super moon” or “super perigee full moon” made its ghostly gigantic appearance. As is standard at the Columbia Room, the second drink is paired with a small plate, which here was a square of fried tofu over purple cauliflower – which I’d never had and am now obsessed with finding at the farmer’s market. The small plates are always inventive and intended to awaken the palate to more. They aren’t intended to fill you up, so keep that in mind when planning your visit. This is certainly one of the most impressive things about my return visits to the Columbia Room – the consistency of the overall experience. It’s still as relaxing, with the same dedicated service and quality of product, as it was at the beginning. The deep color of the Perigee Moon was striking as Katie mixed it up, due to the addition of Aperol and blood orange juice. The drink also included Siete Leguas silver tequila, Aperol, agave nectar, a dash of celery bitters, and was topped with sparkling wine (she used Fizz by Thibaut-Janisson winery in VA). The garnish was truly gorgeous, a full fuchsia blossom adding to the intense color with a green celery curl adding contrast. The first note was the celery from both the garnish and the bitters. The whole mixture of vegetal, floral and fruit flavors reminded me of that first day working in the garden after the rain. It was truly beautiful. 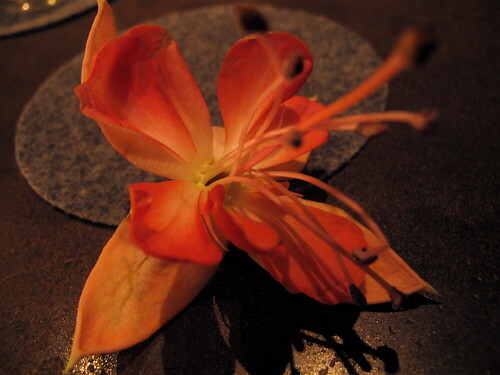 We even nibbled a bit at the fuchsia garnish. Perhaps we were a wee tipsy at this point. The third round at the Columbia Room is tailored to your taste, and my girls laughed at how well Katie called it for me. 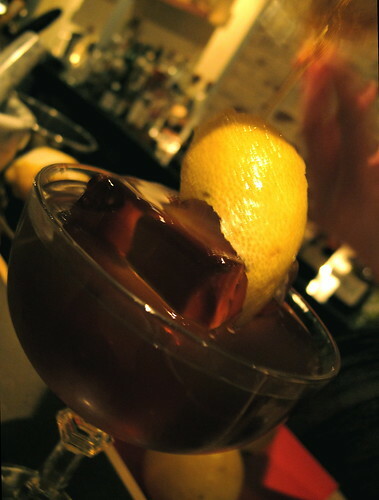 “That’s you all right, funky and bitter,” one chortled as the bottles of ingredients for the Appetizer a l’Italienne were lined up on the bar. Carpano Antica Formula vermouth? Oh yes please. Fernet Branca? Sigh. 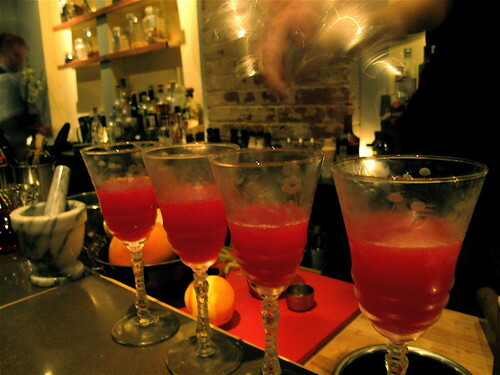 I have a serious admiration for Italian amari – bitter liqueurs like Aperol, Averna and Campari. But until this point I hadn’t tasted Fernet Branca, which Imbibe magazine rightly describes as “bombastically bitter.” I can’t think of a better adjective. One whiff and I was in love. Again, it’s those deeply intense nature flavors that get me. 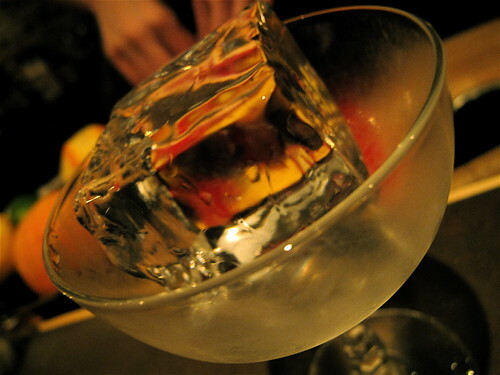 Not to mention, how could I not love a cocktail with a perfect cube of ice as its centerpiece? Appetizer a l’Italienne also has a dash of absinthe and a dash of simple syrup (made with cane sugar), with a large lemon peel garnish. There is a lot going on here – Carpano Antica is a glorious red vermouth with a very complex botanical flavor, matched with the radical bitterness of the Fernet Branca, both are tempered by the absinthe (I never thought I would ever say absinthe tempers anything, but here it is in a supporting role). Sipping it down, I went to cocktail nirvana. The Columbia Room is located at The Passenger at 1021 7th Street Northwest, Washington D.C., DC 20001. Closest Metro stop: Convention Center (Yellow/Green lines). Reservations required online.